Roll grinding wheels are ones used for grinding big rolls of steel mills. It is a glorified form of cylindrical grinding in which the roll is held between centres and the wheel traverses across, thereby grinding the rolls. 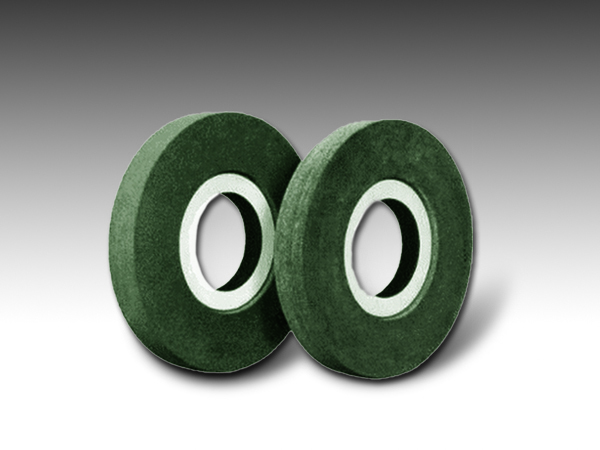 The benefits of this grinding wheel are more removal, less dressing required, freer cutting (less heat), and it is more uniform and consistent. It also has a lower tendency to glaze. It is used in rolling mills to grind hard work and back up rolls. It is used in steel, aluminium, brass, copper, textile and paper. The large size and hardness of the rolls being ground requires a higher degree of operator technique and skill to impact the desired shape and finish. The different types of wheels are straight, recessed one side and recessed two sides.